WOODSTOVE APPLES- for all you scrimpers, homesteaders, and cabin dwellers! Anyway, It couldn’t be more simple and its a means to use your not-so-prime fruit. In my case, I buy the bulk-packaged oldish apples in the back of the supermarket. The total of what you seen in the photo (minus two apples I saved for “ghetto/campfire apple pie” (that’s for another time)) cost me a whoppin’ $2.40 (about 10 apples total). The end result will make a good quart or so of apple chips-which are REAL good (and not as bad for you as, say, pork rinds!). If you have your own apples trees on the other hand, you’re a step up on the rest of us. 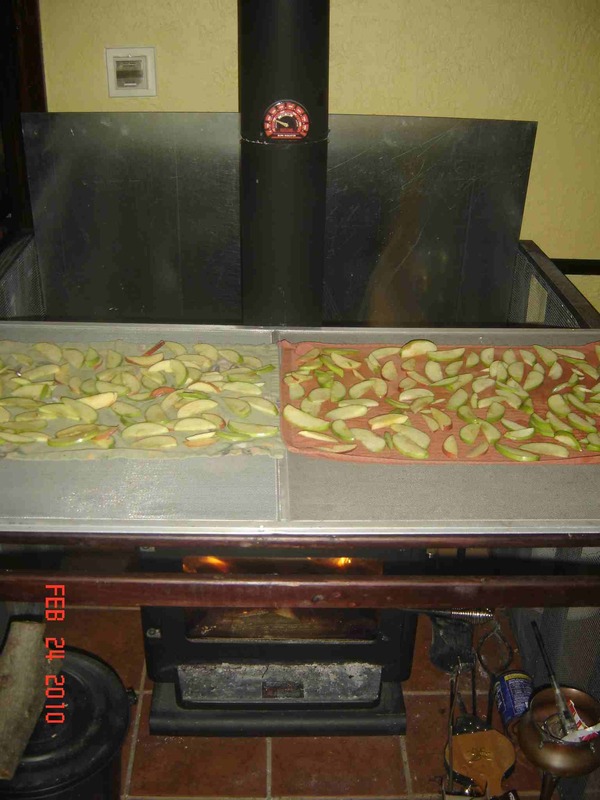 Just cut the apples into thin slices, toss them in a large zip-lock or container, seal after adding lemon juice (fresh or from a bottle (the acid helps keep the apples from oxidizing/browning) and gives them a great flavor)), shake, and then lay them on a drying screen suspended over a woodstove. Also, in a pinch, you can use lemon-lime sodas like Sprite as well….or I’m sure orange and lime juice would work great too! THE DRYING RACK: In my case, this is a dumpster-salvaged storm window screen (the panes went into the construction of my ultra-mini book-reader’s cabin (comin’ soon- or scroll down to “the coccoon entry”) sitting atop my “woodstove alcatraz”- a homemade rig I built around the stove to keep my two young kids safe/uncharred. 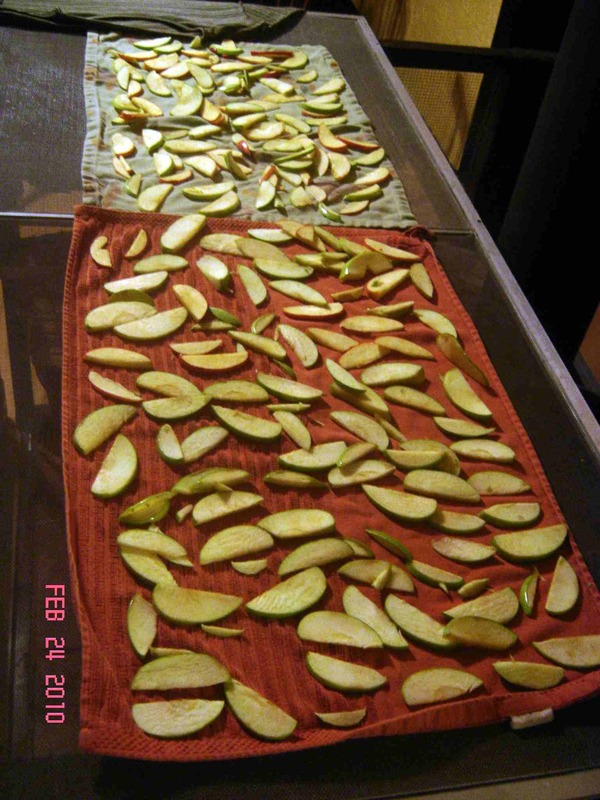 NOTE: With aluminum screens (windows/doors, etc), since its a metal not so, er, “healthful” to humans, the fruit to metal contact is elimated by laying your fruit on top of a few dishtowels- which still allow the rising heat to pass through and slowly dry out the apples. After a few fires, or days, BAM!- its “Wapples” for all! Pears work great too, and I’m sure many other fruits would be fine as well. Any ideas, and/or added advice and recommendations, PLEASE let me know. ‘Til next time, I’ll be munchin’, readin’ some of YOUR sites, and sippin’ some of my homemade dandelion wine that I made a few seasons back. "A Shack in a Snowstorm (in the Author's MA Hometown)"
I’ve been meaning to photograph this little shack in my own Massachusetts town for awhile, and during a recent snowstorm, I finally had to get my arse out of the car to do so (and for once happened to have my camera!). Its a hokey little shack, but one with a ton of character. 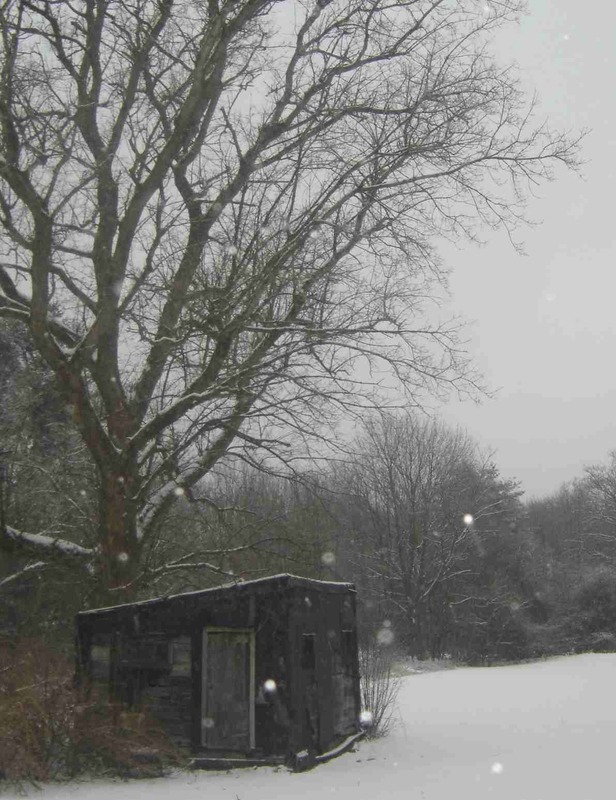 Its photos and shanties like these that lead me to wonder what has transpired through the history of this little shed-house…. Who built it? Why? Was it lived in? Its covered in tar-paper siding, and given the age/appearance of this shack, it looks as if its held up reasonably well for a long, long, time. Not the prettiest method- but cost-effective (a ways back I found a full roll of roofing paper that someone had left on the curb for trashday). 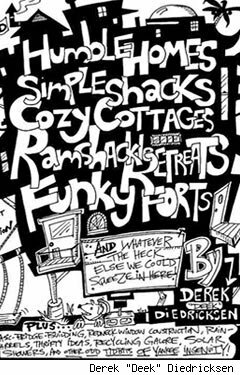 Also, my indie book “Humble Homes, Simple Shacks, Cozy Cottages, Ramshackle Retreats, Funky Forts (And Whatever Else We Could Squeeze In Here! )” by Tiny Yellow House Press, was just written up in “RENTED SPACES”. On this site’s right hand column, scroll ALL the way down for info on ordering. http://www.rentedspaces.com/2010/02/22/diy-shacks-with-punk-rock-style/ Thanks to Katie McCaskey! And book orders… email me at kidcedar@gmail.com for any other questions. I’ve also been lucky enough to have high-caliber people/authors such as Mimi Zeiger, express interest in seeing the book- flattering, whether she/they review it or not. (Her work’s great- check out www.loudpapermag.com and she authored the ultra-cool book “Tiny Houses”). More recently- THANKS so much to Amanda Kovattana over at http://dejavuconstruction.com (A cool eco/organization site and she’s VERY talented) who reviewed the book both for her site and for Energy Bulletin. She also loved the “Inverted A-frame” design/illustrations in my book, and has been scheming for the possible future construction of it! If she follows through, I can’t wait to see it! Amanda, you rock with the power of 48 vikings! (A real good thing). And thanks to all of you who have been incredibly supportive so far! And if you order the book- def. don’t hesitate to ask me to draw, write, sketch whatever inside the cover for you- I have a blast doin’ it). Any probs/questions- let me know (kidcedar@gmail.com)….and keep scr0llin’ down for the new Jay Shafer comic (for The Tiny Tumbleweed House Company) and more, that I’ve recently added. THIS IS AS SIMPLE AS IT GETS! Yet, its one of the most responded to redneck-thrift/construction/recycling tips (alongside the sandbox-water-collection unit, stereo-glass makeshift windows, redneck rainbarrels, and the plans for the “Inverted A-frame”) in my book “Humble Homes…”- which you can check out here…. Materials: One single wine cork, a 3 1/2 inch black dry wall screw (or something equivalent), and some polyurethane (although not necessary). You could also stain the corks to match your molding or woodwork if need be. Note: Cork or the synthetic “foam” corks will both work! Construction Time: 1-2 min- seriously. The origin: I’ve never seen someone make one of these before, as unprofound as they are, but when I was self-finishing my basement, I really couldn’t find any doorstoppers that I liked the look of, and that would fit the rustic look of my d.i.y. “cave”. Shortly after, while suckin’ down some cheap red vino one night and tossin’ the cork into a giant container I have (I save them all for some future/eventual art project (or to throw at select relatives when they visit), it came to me. 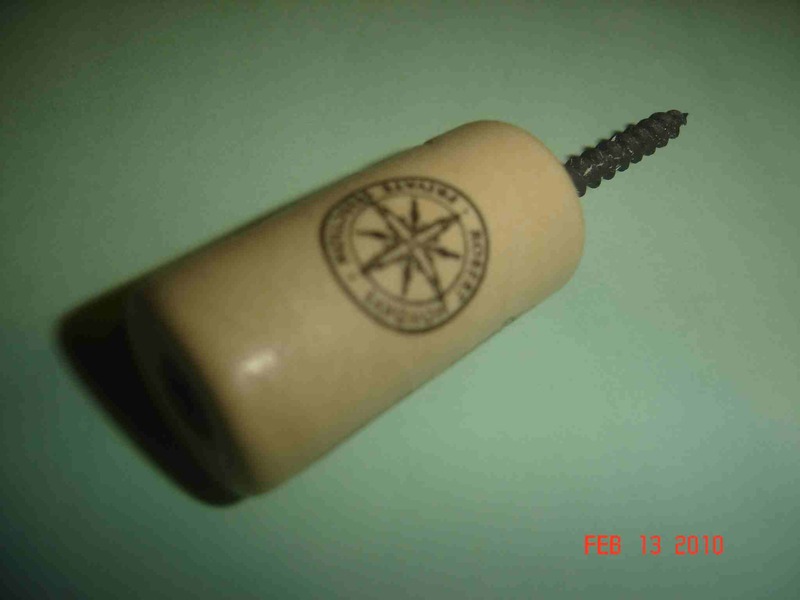 HOW: Just slowly center a drywall screw on the end of a cork, drill it in until the head “puckers” into the end of the cork (or you could pre drill and countersink), and that’s it. The now protruding screw-head on the opposite end can thereby be further drilled into the wall/your baseboard. Not rocket science, but it makes for a cool, different, subtle conversation piece for those who notice. You could even go so far as to save a special occasion cork (say, the champagne cork from your wedding- or divorce-papers party- lol) and utilize it as a more meaningful doorstop- one with a great story behind it. They look pretty decent. And the cost is almost ZERO (one single screw!). Not that other door stoppers cost much, but when you factor in the time, cash, and trip to go buy the other plastic/metal ones at a box store, it is a time saver- and gives a unique, earthy look. Warning: You just may get a rep as a drunk if you use too many of these throughout the house! I have one in my home, and plan to use them in a few of the cabins I’ve built and am building. 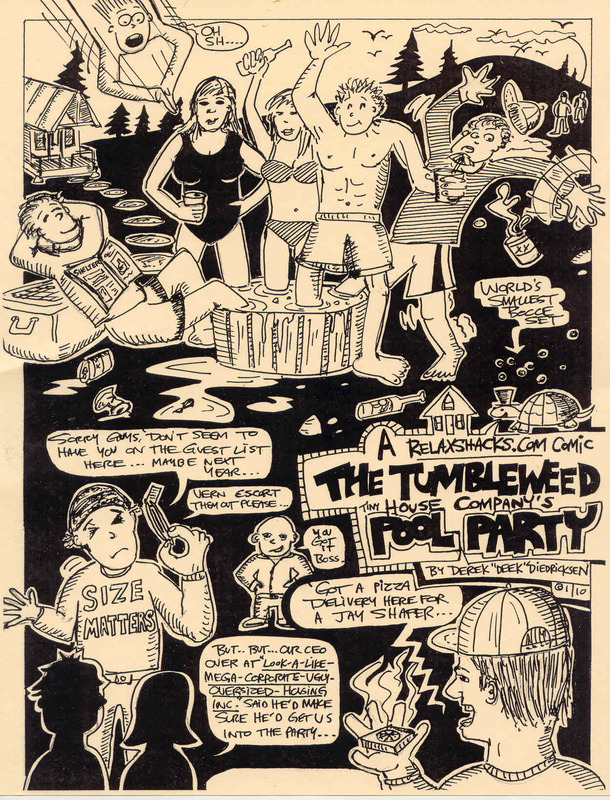 A Jay Shafer Tiny Tumbleweed House COMIC!? I have stacks of self-drawn comics and doodles strewn around my place, and fittingly, thought I’d post this one for the simple amusement of small-housing/small living fans and supporters. Jay Shafer runs (for those unaware) The Tiny Tumbleweed House Company, which produces and designs some GORGEOUS tiny homes- and sells their plans as well (http://www.tumbleweedhouses.com not that he NEEDS the link/hits- Jay’s been on Oprah!) . Never met the guy, but I cranked out this little one-panel comic a little ways back while watching some late-night Smurfs re-runs….and I have a few other TINY HOUSE COMICS in the works, or finished, that I’ll toss up here at some point. Thanks for lookin, and feel free to grab it for your sites/pass it on. I had a blast drawing it… and Jay, like Michael Janzen, Lloyd Kahn, David and Jeanie Stiles, Dan Price, and Lester Walker, was one of the inspirations behind my new indie, small housing book (scroll wayyyy below for details). 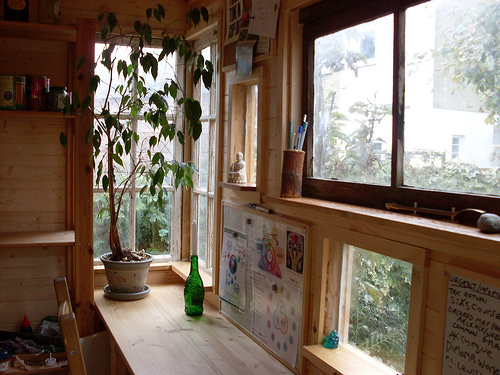 "Talk about picturesque- A cozy looking d.i.y. cabin resting snugly in the bitter UK cold." I recently received an email from a guy named Graham Burnett in regards to a purchase of my D.I.Y. small housing book (for whatever reason, I’ve sold quite a few of ’em in the UK- bless ’em! Thanks so much!). Graham immediately came across as a very down to earth, friendly, and supportive person, and is himself a self-made author of SEVERAL books (check them out at his site http://www.spiralseed.co.uk AND http://www.humbledesigns.co.uk -BOTH very cool and informative sites/blogs (concerning his small cabin, permaculture, urban gardening, simple living, his artwork). 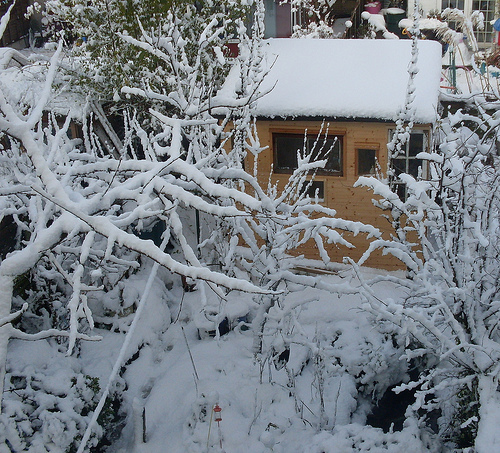 In anycase, here’s a quick look at his garden/office cabin. Now THAT’S a “cubicle” I wouldn’t mind punching a clock in. I just love the random assortment and array of windows, all of which would seem to frame its own unique view of his gardens. GREAT work Graham, and I wish him nothing but the best. "Just add a hammock, and no work will EVER be done"
Sounds like he ultimately plans on adding some solar panels to this structure, and I’ll be anxious to see the end results. 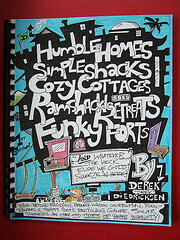 -Deek D. (to order my BRAND NEW small housing book- keep scrollin’ way down for info).